1) 1 Day Outstion Package : 600 Km. 2) Kms Starting from Office to Office. 1. Tuljabhavani Mandir- This Temple is considered as the 51th Shakti Peethas in India Maharashtra. 2.Chintamani Temple- It is a Beautiful stone carved structure which is situated just outside the main Temple of Tuljabhavani . 3. Kallola Tirth- The Kallola tirth is Ranked 3rd out of 10 th places to visit in Tuljapur its a huge water tank which is located in the Prakara Mandir. 4. Gomukh Tirth- Gomukh Tirth is a beautiful place in Tuljapur City a awsome waterfall which ia about 6 feet in height. 5. Vishnu Tirth- it is a popular tourist attraction of tuljapur which has 3 entrance which are linked by stone steps. Mutt was a devotee of Tuljabhavavi Devi. celebrated amongst those are Diwali the festival of light then Navratri which is dedicated to Goddest Durga which occours twice every year. the festival of colors holi is celebrated in a very colourfull manner in tuljapur it is considered as one of the biggest colourfull festivals for thrnatives. there are various hotels and restaruants where you can relax for some time. The Languages known there are english hindi and marathi. 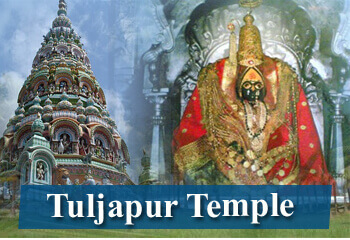 Tuljapur is considered as the religious tourist destination. the temple is open from early morning 5am to night 9pm, this temple is good for nivarna seekers.